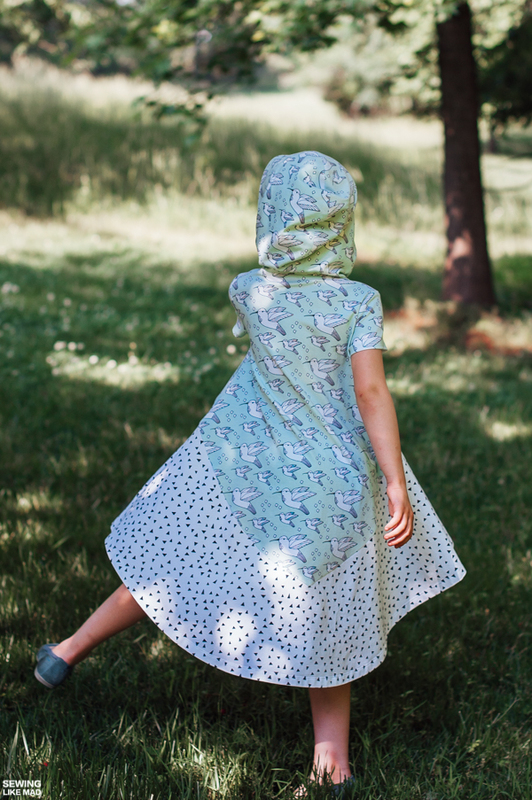 Sewing Like Mad: Groove Dress in Elvelyckan Fabric. Groove Dress in Elvelyckan Fabric. So It's been awhile since I posted last and let me tell you what I have been doing since then....trying to edit these photos, gah! I don't know what is wrong with me but instead of just retaking the photos when I realized that the spot we took these photos were not as shady as I thought it was, I stubbornly tried to save them via editing. Gah GAH! This post started with me being contacted by Elvelyckan Fabric who asked if they could send me some organic knit fabric for me to sew with. Uhh, yeah sure, thank you very much! 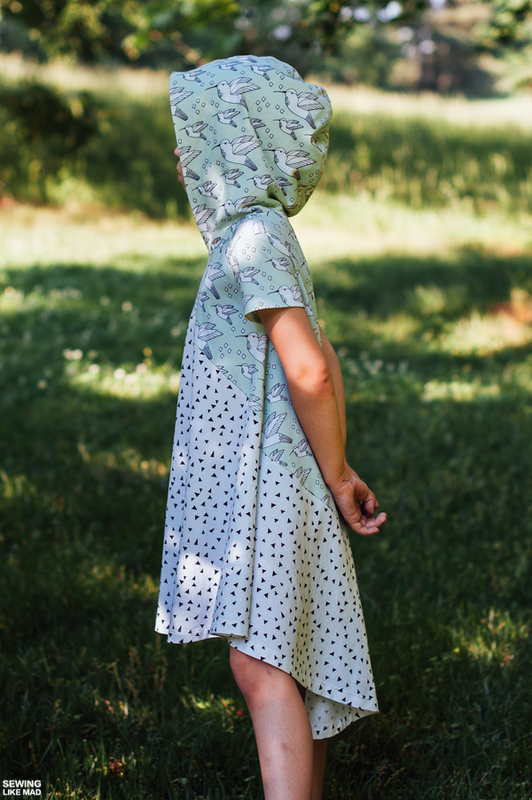 Then a friend of mine told me that she had just bought the Groove Dress from Madeit Patterns and the awesomeness of the tutorial/booklet basically gave her tears in the eyes and I knew it was time to try it out. And no reason for muslins when you can cut straight into your new amazing knit, right! Ahem! But hey....my friend was right! 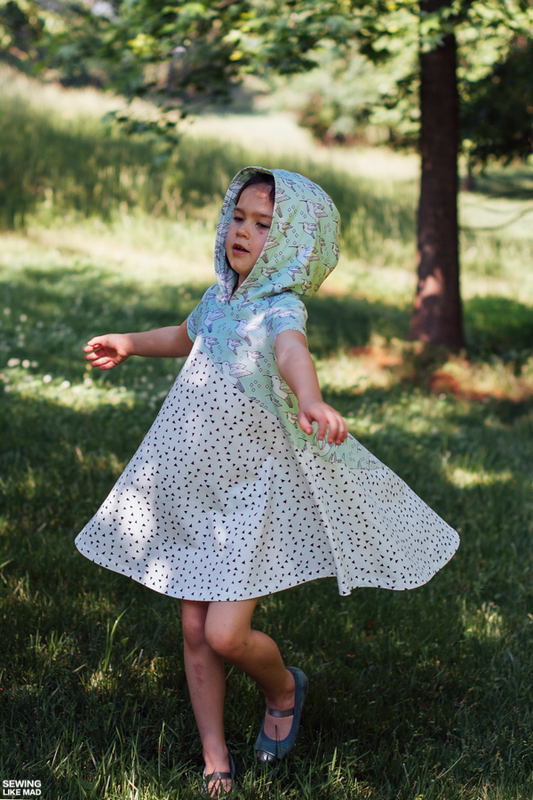 This is an amazing pattern in every way and I wouldn't have changed a thing if I had sewed a muslin first. Yay! 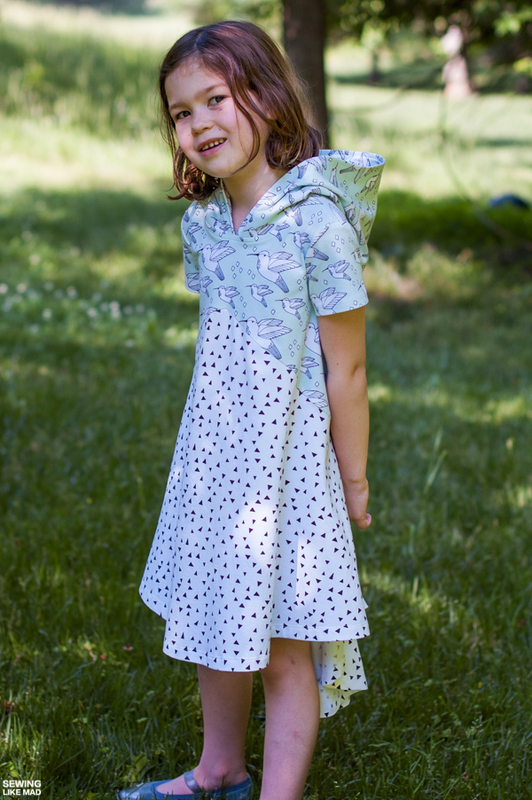 The Groove Dress is a swing dress style and therefore uses quite the amount of fabric. 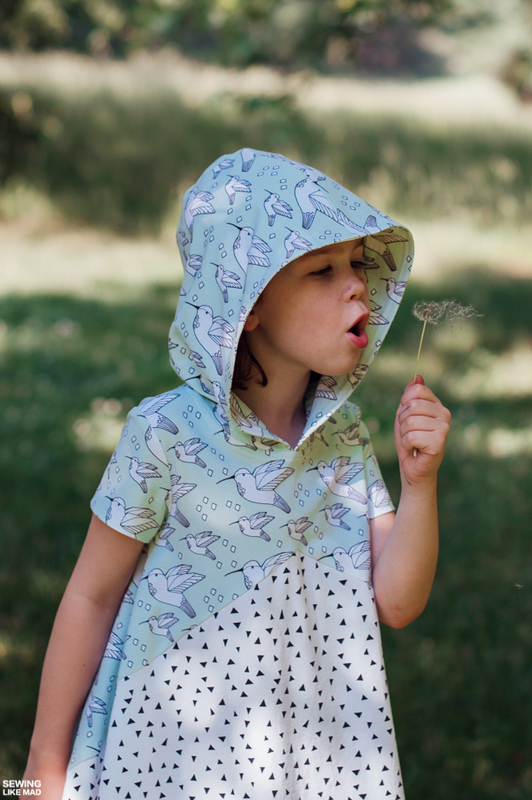 Especially if you choose the high-low hem and hood option. I had around 1 meter of each these two prints - which I suddenly realized totally matched up - so next step was a way to figure out how to utilize those two fabrics in the same dress. So I sort of used the high-low theme and created a high-low cut in the bodice and I was ready to roll. Both my kids love hoods so it was a no brainer to use that option. You also have the option of a neck rib or cowl. And with the mention of the neck rib I'm reminded of why I'm particularly happy with this pattern. It has two technique options for sewing on the neck rib but it does not stop there. They explain which is for beginners and which is for a more professional result. Yes yes yes! 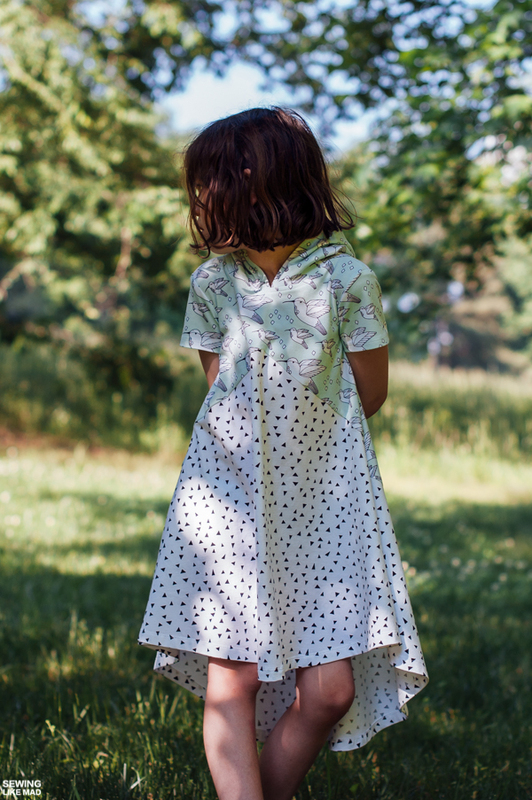 There are many ways to sew a piece of clothing and I have mentioned many times before how we are all different and have different goals with our sewing. And that's all good! 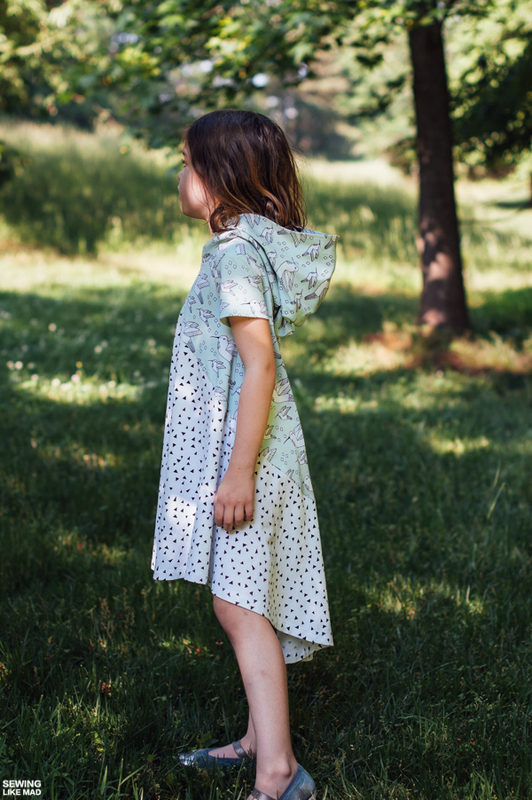 Some just want a finished piece of clothing before their kids' nap time is over, while others enjoy the geeky process of refined finishes etc and will happily spend a week sewing the same item. And most of us are somewhere in between. We also usually change over time. As a beginner you just want something finished because everything is a challenge. Later you start feeling ready to venture into more difficult techniques (with more beautiful results). But what I find so very important is the information of which techniques belong in the fast-paced end and which belongs in the refined and professional end. It's impossible to choose the appropriate technique for your desired end result if you don't have the right information. So to see info like this in a sewing pattern made me incredibly happy. Thank you Madeit Pattern - you made(it) my day, hehe. 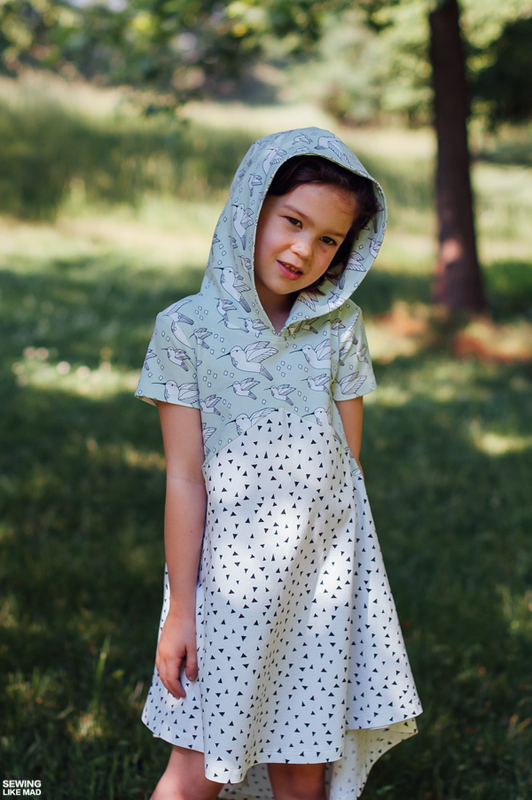 And did you know that if you purchase either the kids or the adult pattern then you get the teen pattern for free. Nice! I also want to talk a bit about the fabric! Elvelyckan specifically told me to be honest about my opinion about the fabric. I love that a company is confident enough in their product to request honesty. I also now understand the confidence because the fabric IS excellent. I prewashed the fabrics and the prints and colors are still as clear as before. I also really like that it is soft and has a great drape (as you can see on the above photos) but it is not so soft that it gives you problems while sewing with it. I actually ended up sewing this on my sewing machine and then serged the seams afterwards. Basically treated this fabric as woven most places and that worked out perfectly. No wavy seams or anything like that. Hemming with my coverstitch was also a total breeze. Man, I soooo want to make myself one too but will need to go knit shopping first. Get your own Groove Dress HERE. Check out Elvelyckan fabric HERE. I have been looking forward to this post ever since you posted a peek at that dress! What you did with the bodice is spectacular -- I love it so much!! And I totally agree about MadeIt Patterns. Every single one I've tried is amazing. Can't wait to see your dress next!! I love the points you added to the bodice, sewn perfectly - of course!! 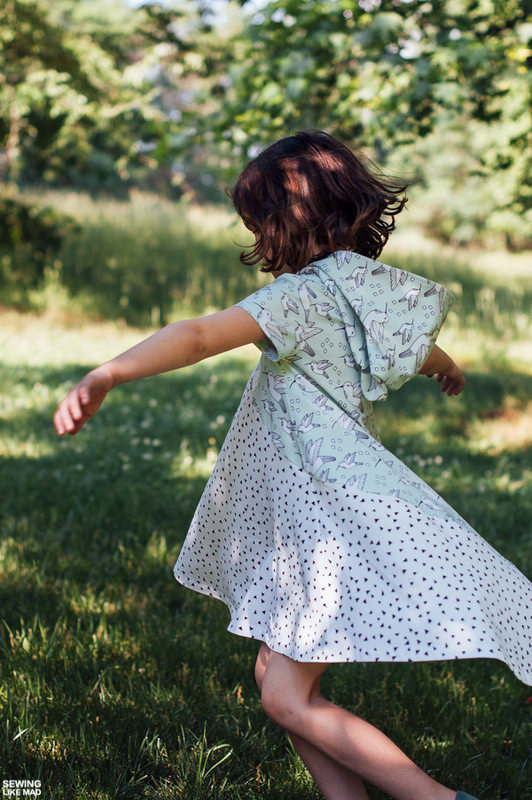 I love the Groove Dress and all of the options and that fabric is pretty amazing too! The way you played with the lines of the dress is spectacular. A very clever way to show off beautiful fabric. I am so curious about this pattern now! 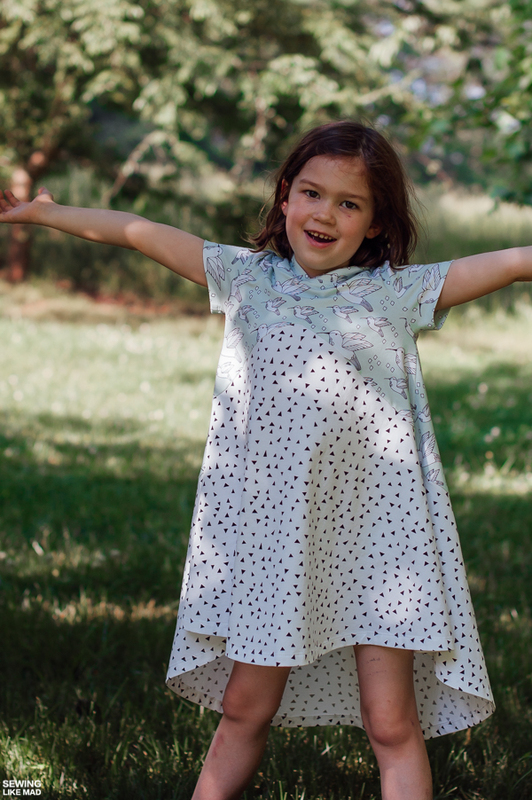 Thank you for such lovely words about our pattern. You have TOTALLY made my day. Your dress is BEAUTIFUL and I LOVE, LOVE, LOVE the fabric. I wonder if you would have colour blocked even if you had 2m of the same fabric? It looks soooo cool how you mixed the fabrics together, just what I have come to expect from you. I just can't take my eyes off of it.